High Speed Rail super-express from San Francisco to San Jose? The 2014 Draft Business Plan for High Speed Rail includes some early hints about how Caltrain and High Speed Rail service might interact. Clem Tillier’s Caltrain/High Speed Rail Compatibility blog has a writeup and analysis. The new business plan envisions High Speed Rail service delivering 4 trains per hour serving Peninsula stops within the corridor between San Francisco and Gilroy in 2040. The SF-SJ “super-express” would take 47 to 49 minutes, an 8-10 minute savings over today’s 57 minute Caltrain baby bullet. HSR projects that peninsula stops would generate 2.5 million riders per year. At $22 from SF to SJ, the peninsula stops would produce $51 million / year in revenue. This would be less than 1% out of an projected $5.7 billion HSR revenue base, but a much higher share of Caltrain’s operating revenues, which were $75 million in 2013. If Caltrain doubles ridership, that would be 30% of the local market. If San Jose’s strategy to turn the Diridon Station Area into an employment center and destination that is tightly linked to downtown, a reasonably affordable San Francisco-San Jose super-express might be welcomed by riders. But a High Speed Rail operator taking 30% of local revenues would have unwelcome consequences for Peninsula corridor service. There are other motivations at play. The High Speed Rail authority has a mandate to not require an operating subsidy, and Caltrain, like other commuter rail and rapid transit services in the US (and roads and highways) requires public operating funds. So a HSR operator might have an incentive to skim the profitable parts of a local market. On the other hand, the Bay Area revenues would be a drop in the bucket of the High Speed operator’s revenues. 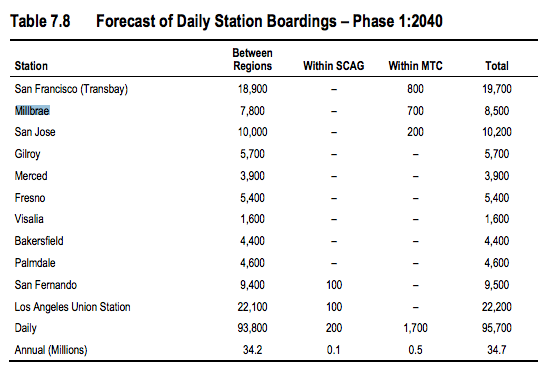 As Tillier’s analysis suggests, an HSR operator would have more to gain by encouraging long-distance over local trips. Meanwhile, the Bay Area has a regional goal to reduce greenhouse gas emissions; and Peninsula cities are increasingly taking responsibility for reducing vehicle trips. And Caltrain owns the rails. So there would be a local and regional incentive to negotiate a deal that delivered better regional transit mode share. Also, in an ideal world, Caltrain would be a seamless feeder service for long distance trips. A rider could buy a single ticket, get on at San Mateo or Redwood City or Palo Alto, transfer in San Jose and head on to Los Angeles. There will be some business arrangement regarding the value of the feeder service. In follow up to the recent forum in San Francisco about options for Caltrain governance in the age of electrification, international rail consultant and HSR peer review board chair Lou Thompson commented that it might be beneficial to have the private operator for High Speed Rail service to bid for the Caltrain contract. If there was a single operator, how would this impact the balance between long distance and regional benefit? It is early – the first High Speed Trains are not expected to get past San Jose to San Francisco til 2029 at the earliest. This is an early view of an important discussion and debate. What do you think about how best to balance local and long-distance service? It’s quite likely that the long-distance HSR operator will prohibit passengers from using the train for peninsula journeys. Take a look at Eurostar service between Paris and London. The train stops at Stratford, Ebbsfleet and Ashford during the 75 miles it spends on English soil, but no boardings are allowed northbound and no dropoffs are allowed southbound. There is a separate “Southeastern Highspeed” service which runs from London to Ashford with stops at Stratford and Ebbsfleet only. There is also a cheaper, slower “Mainline” service that makes about 9 stops on the legacy line between London and Ashford. The high speed service costs about 50% more than the mainline service and takes less than half the time. Translate that to the peninsula and the implication is that the long distance HSR operator would not allow boardings at SJ or Millbrae northbound, or dropoffs at SJ or Millbrae southbound. Caltrain might run an express service from SF to SJ stopping at Millbrae plus maybe Palo Alto or Redwood City. This would be more expensive than the local/limited trains but less ruinous than the sort of prices a long distance HSR operator would charge for the same journey, if it were allowed at all. Jon is correct. Why the “Southeastern Highspeed” service works is that is doesn’t get entangled with the airline-style security for Eurostar at the St. Pancras terminal even though it uses the dedicated track, and its stops allow the Eurostar traffic to “overtake” at the stations mentioned. It makes you wonder whether HSR shouldn’t bypass the Central valley altogether with an I-5 routing and have a regional high speed service as a feeder for HSR instead? There’s no need for the HSR operator in California to have airline-style security, though they probably will do anyway because reasons. If they do, it increases the likelihood that Caltrain will run the peninsula express service rather than the HSR operator, without the airline-style security. Long-distance passengers will put up with airline-style security but commuters won’t. Eurostar’s uniqueness is because of “internation train” which requires passport control. All other high speed rail in Europe, Asia accept short distance train if custmer want to pay for it.